When a comic was deemed by the publishers to be no longer viable, instead of passing directly into comics history it would be 'merged' into a more successful title. 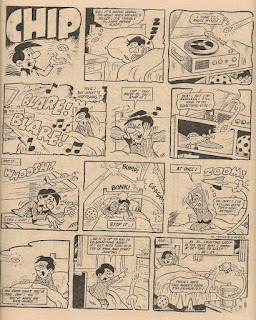 A number of the more popular strips from the failed comic would be amalgamated into the stronger, longer-running companion, the intention being that a significant number of the readers of the defunct comic would be persuaded to follow their fun-pals into the combined publication, delivering a boost to the main title's readership numbers. For a while after the merge, the title of the failed comic would appear beneath the main title on the cover of the fused funny paper, until quietly being dropped some time later. So how long did the merge between Whoopee! and Cheeky last? The answer is... it depends where you look. IPC had long exhibited concerns over newsagents selling their titles at more than the cover price. 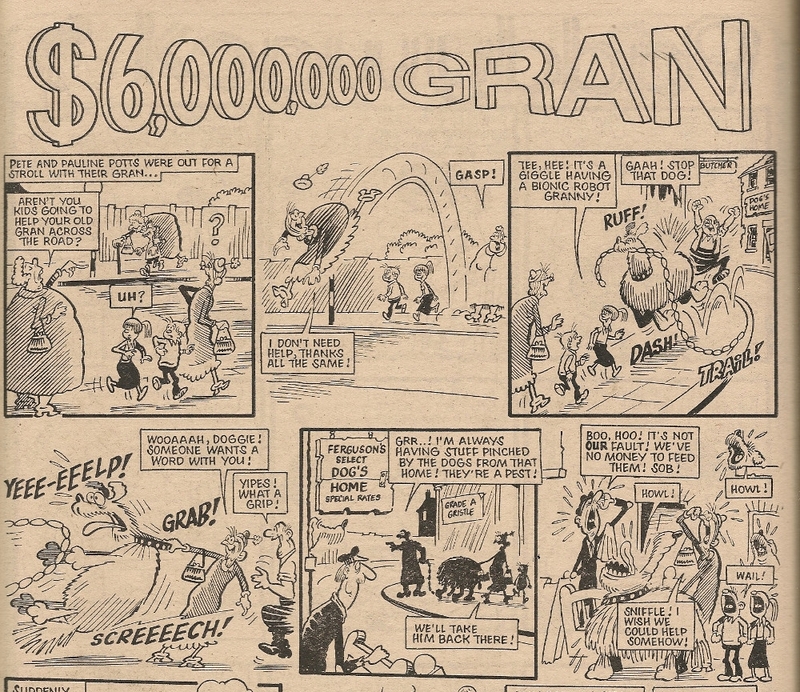 I'm not sure how prevalent this comic-price-inflating activity was (I can't really imagine many kids would stump up more than the cover price for their favourite title), but the publisher included some small print in each of their comics, usually at the foot of the back page, advising retailers that price-hiking was not allowed. They were also keen to make it clear that subscription facilities (inland and overseas) were not now available, probably an attempt to stop kids sending in postal orders and asking for their favourite comic to be posted to them from King's Reach Tower each week. The text of the small print always included the comic's name, and if we judge the Whoopee! and Cheeky era based on the content of these warnings to unscrupulous comic vendors and would-be subscribers, then there never was such a period, as Cheeky was never referred to alongside Whoopee! in the legal jargon. From the back cover of the second combined issue of Whoopee! and Cheeky. The text remained the same whether or not the cover title was Whoopee! and Cheeky. Sometimes the merged comic was acknowledged in the small print, as in this example from a 1975 Buster and Cor!! The most obvious place to examine in order to establish the length of the Whoopee! and Cheeky merge is of course the front cover, but even in that location things aren't entirely straightforward. 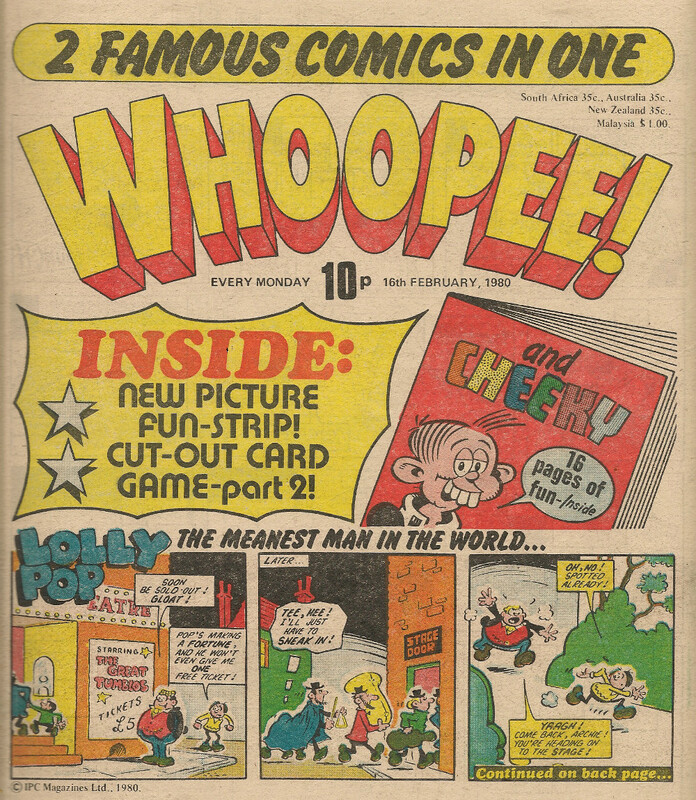 The first combined issue, cover-dated 09 February 1980 did announce itself as Whoopee! 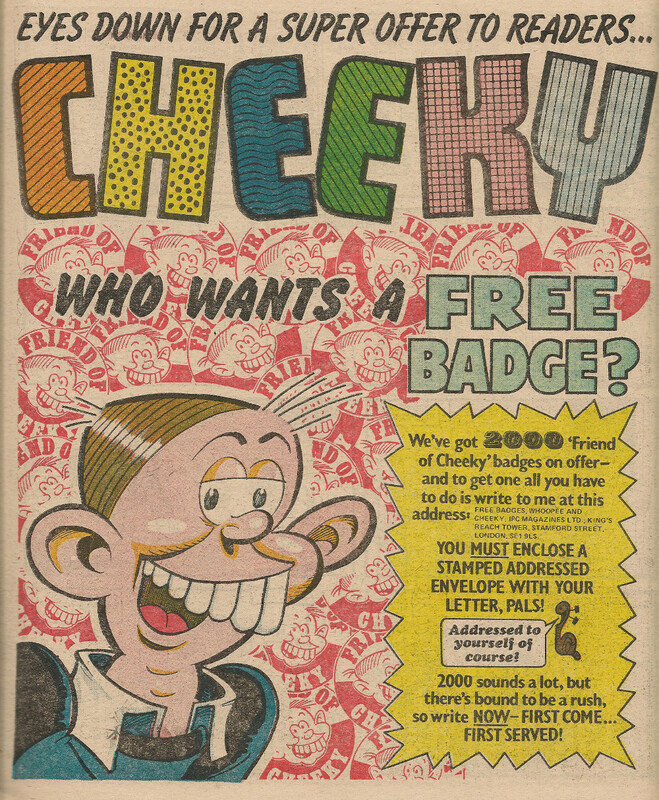 and Cheeky (the incoming comic's full title of Cheeky Weekly was never acknowledged post-merge), as did the subsequent 13 editions. However, for the following 4 weeks, no issues were published due to an industrial dispute. 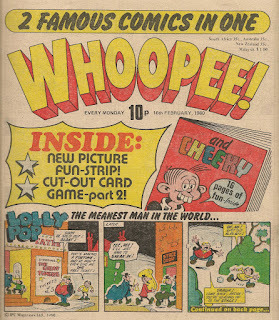 When the comic returned with an edition cover-dated 14 June 1980 it was titled Whoopee!, although a banner at the top of the comic showed Cheeky announcing 'See my Cheeky comic inside'. The next issue to be published was a 2-week edition dated 21 to 28 June 1980 (although the usual 32 pages). This issue was also just titled Whoopee! but with the same Cheeky announcement as the previous edition. Weekly publication then resumed with the issue dated 05 July 1980, and for that and the subsequent 5 weeks the title was again just Whoopee! but with Cheeky's banner announcement. 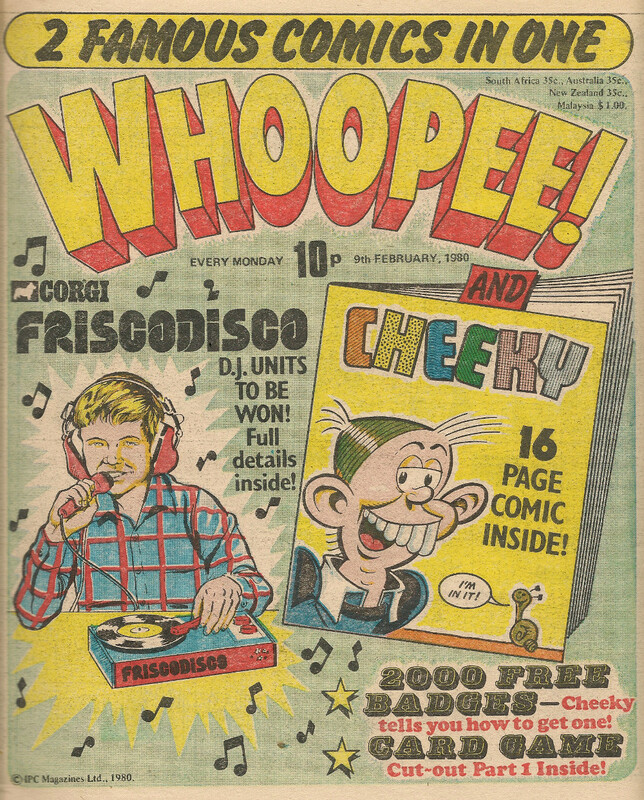 The issue dated 16 August 1980 was just titled Whoopee!, with no announcement by our toothy pal - there was no room for it due to the competition promo. The following 2 weeks saw the Whoopee!/Cheeky banner arrangement return, followed by one week where the comic was again just titled Whoopee! The 13 September 1980 issue returned to the Whoopee!/Cheeky banner design, but a week later we were back to just Whoopee! again as another promotion was featured on the cover. 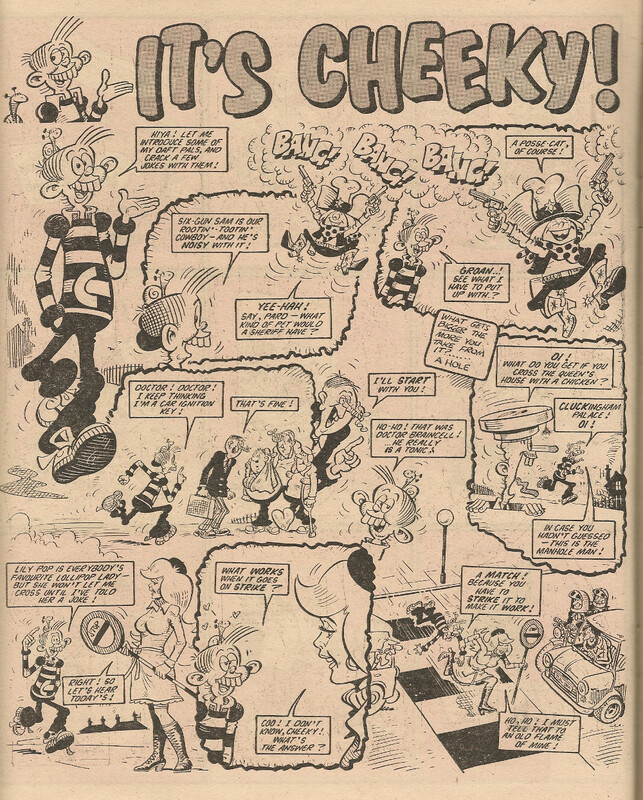 The 27 September 1980 issue featured Cheeky's banner again, but for the final time - the following week's edition was the last issue to include a Cheeky section in the centre of the comic, but it was just titled Whoopee! - a 'Great news for readers' banner bumped Cheeky's from the cover. Another merge wasn't in the offing - the great news was of the How To Draw Comic Strips booklet, the first part of which would appear a week later and its presence in the centre pages was what displaced Cheeky and pals from their erstwhile location. 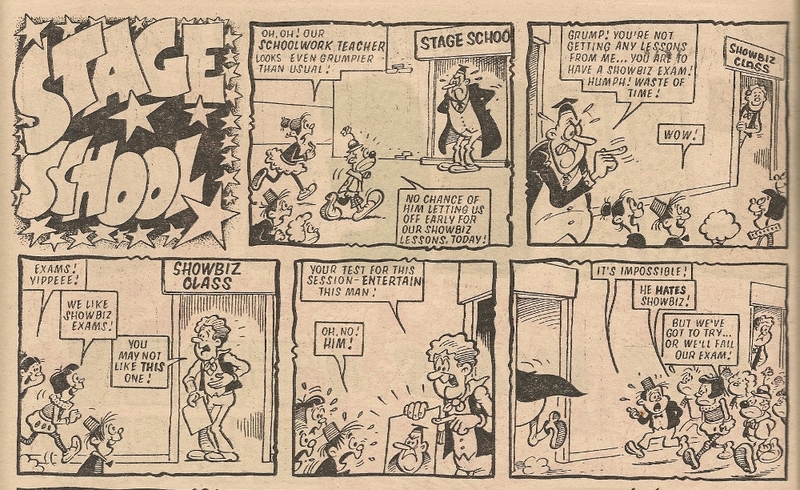 For the next 4 weeks the comic's title was Whoopee!, but the comic dated 08 November 1980 saw Paddywack, having been freed to roam the comic since the demise of the Cheeky section, move onto the front cover and bring with him the 'and Cheeky' to add to the comic's main title. This arrangement persisted for the following 6 issues. 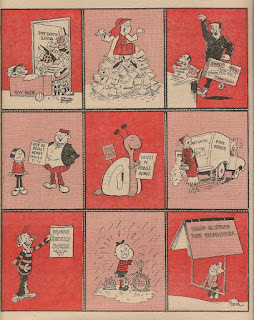 Robert Nixon's festive cover of the 1980 Christmas edition, which prominently featured Mustapha Million, showed the comic to be titled Whoopee! with Cheeky, the only time that particular conjunction was used to describe the relationship between the two titles. There was no mention of Cheeky on the cover of the 03 January 1981 edition as most of the front page was was given over to the announcement of the 1981 calendar inside. 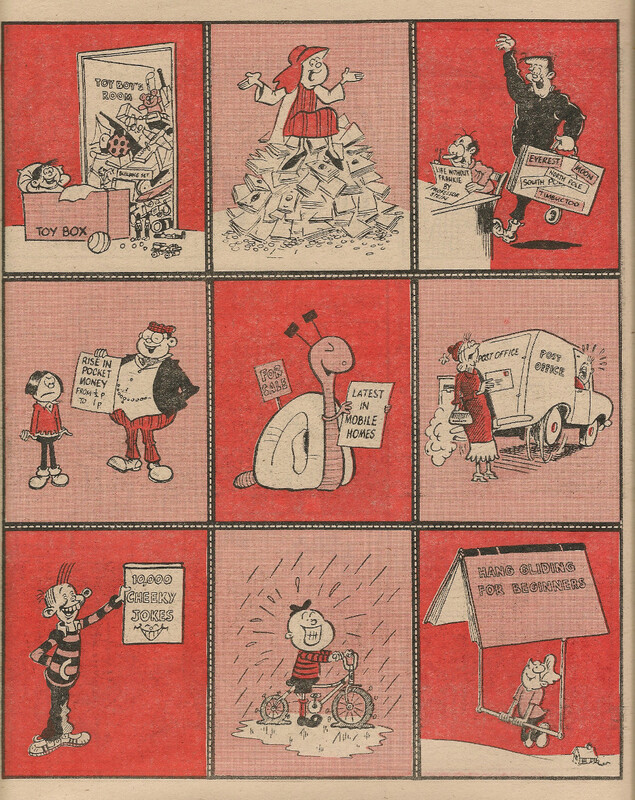 The 12-month planner, drawn by Robert Nixon, styled itself the Whoopee! Calendar since by the end of the year Cheeky would no longer be mentioned on the cover. 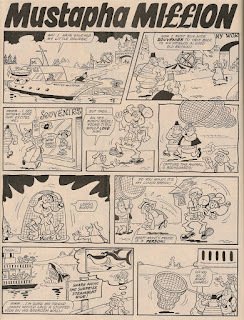 The ensuing 25 issues were titled Whoopee! 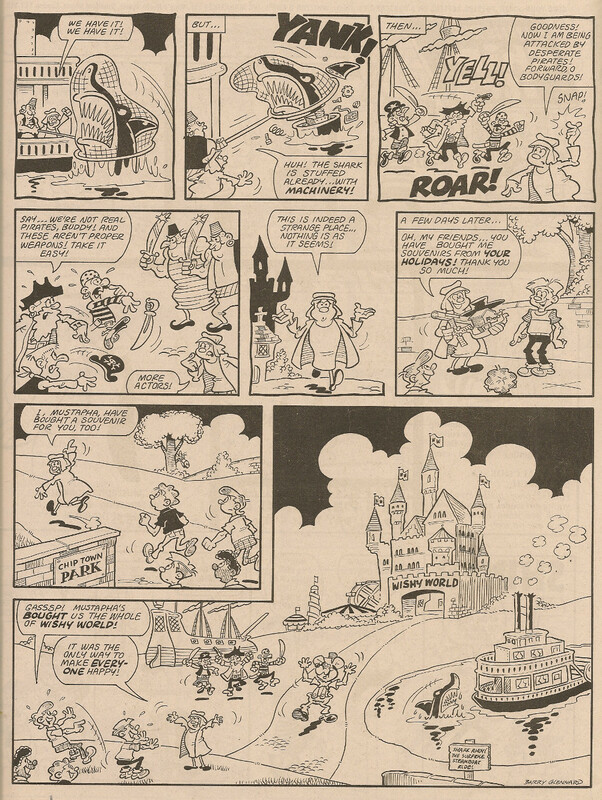 and Cheeky, and then the 04 July 1981 comic's front page heralded a Four Papers competition and the commencement of the cut-out Young Road Traveller's Handbook, leaving no room for a mention of the toothy funster's comic. A week later the title was back to Whoopee! and Cheeky even though the ever-grinning Smiler had usurped Paddywack's prized location. 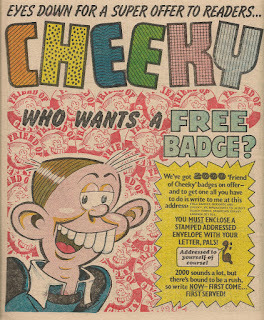 Reference to Cheeky was not included on the front of the comic dated 18 July 1981 due to the announcement of a promotion relating to Wall's ice cream. 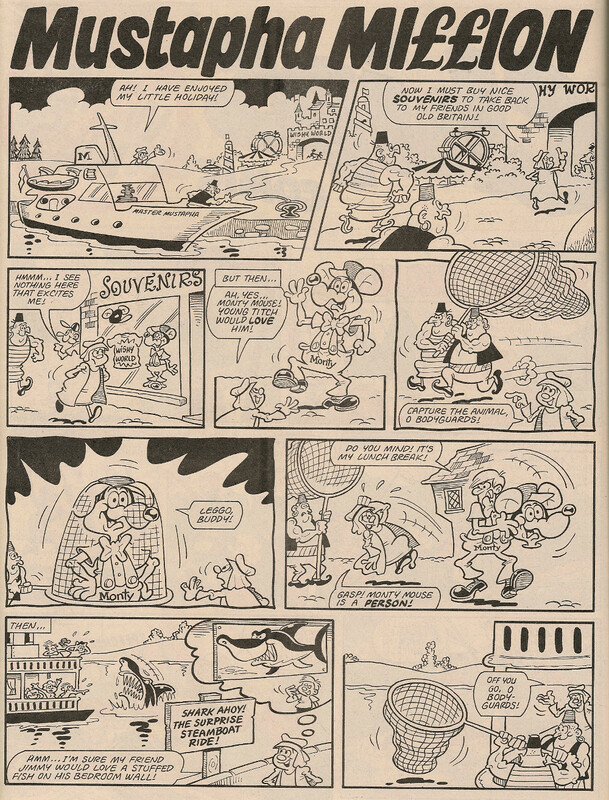 The 25 July 1981 issue was the final one to make reference to Cheeky as its absorbee. Based on the covers, the Whoopee! and Cheeky era therefore can be seen to span the issues dated 09 February 1980 to 25 July 1981. However, there is one further location we can examine, which gives a slightly different view of the situation. As of 09 February 1980 the letters page was titled Whoopee Chit-Chat, in a nod to Cheeky Weekly's Friends of Cheeky Chit-Chat page. From that date, readers of the combined comic were invited to post their amusing missives to Whoopee! and Cheeky at King's Reach Tower. The address for reader submissions remained Whoopee and Cheeky until the issue dated 11 July 1981, after which the address appeared as Whoopee. Thus Cheeky ceased to be referred to in the Whoopee Chit-Chat address 2 weeks before the final 'and Cheeky' reference on the cover (although the Chit-Chat name for the letters page was retained until the 24 April 1982 edition, after which the letters page was re-titled Whoopee! Winners). So although reference to the letters page would suggest a slightly shorter existence, the covers incontrovertibly declare the Whoopee! 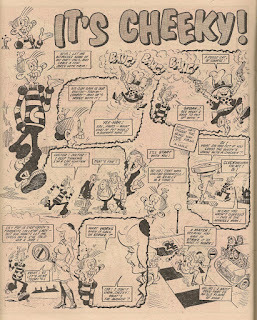 and Cheeky era to last from the 09 February 1980 to 25 July 1981 issues. 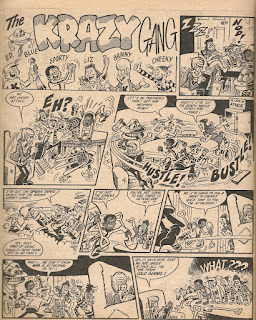 17th April 2019 was a momentous day for all friends of Cheeky as our toothy pal appeared in a new comic strip for the first time since the Krazy Gang feature came to an end in February 1986. I rushed to my nearest WH Smith on the long-awaited day and skidded to a halt by the comic shelves but was disappointed to find no copies of The Cor!! Buster Humour Special in evidence. Had they sold out? Possibly, but I doubt it - I have read reports that in some branches of Smith's the special was located on the top shelf and I must admit I didn't think to look there for it. Anyway, I ordered a physical copy online later the same day and it arrived in the next post, so well done to Rebellion and their fulfillment partners Intermedia Solutions. I was pleasantly surprised to see that Cheeky gets to appear several times in the special. Prior to reading the special I wondered if he would play much of a part in Lew Stringer's Who's In Charge? strip (script by John Freeman) as in Lew's preview of the strip our toothy pal is silent. However I'm pleased to report that Cheeky is involved in the plot and gets a few lines of dialogue, including the strip's closing comment. Lew has also provided an introduction to characters from classic Fleetway/IPC titles, among them the mighty-molared mirthster, who is seen in a panel drawn by Frank McDiarmid and lifted from the 1982 Cheeky Annual. Great to see Frank represented. 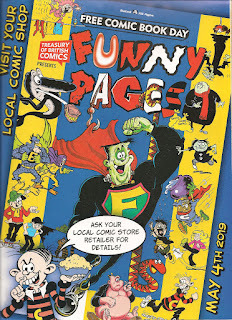 Cheeky also gets some dialogue on an advert for the forthcoming Free Comic Book Day Funny Pages comic - the custard pie image being Robert Nixon's rendition of our toothy pal from the cover of his 1981 annual. 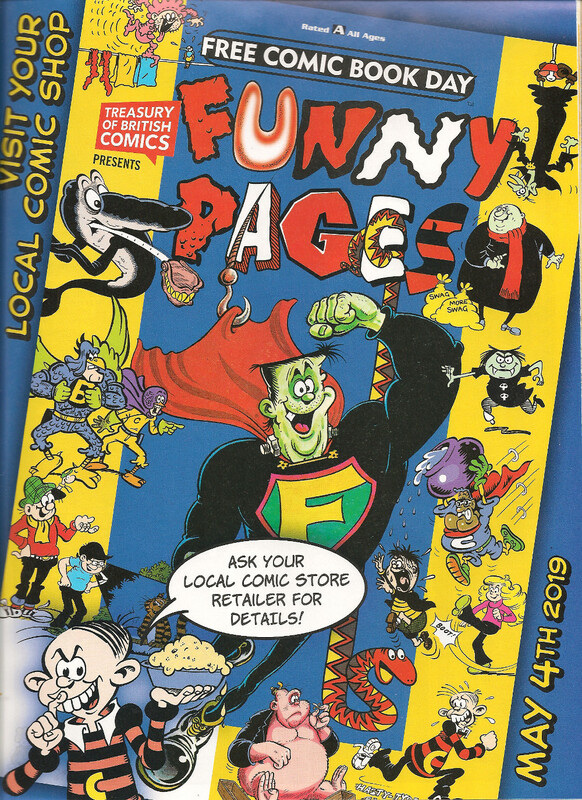 The pic of Cheeky at the bottom right of the Funny Pages cover is Frank's work sourced from the 1982 annual. Whizzer and Chips dated 12 September 1987 saw our middle eastern mate embark on a sortie into enemy Whizzer territory for the first time since his 27 June 1987 raid on the recollection-deficient Bernie 'Memory' Banks. It has to be said that Mustapha doesn't make much effort to conceal himself, so you shouldn't have any trouble spotting him as he intrudes upon an uncharacteristically violent Sweet-Tooth. I don't remember boxes of wine gums ever containing cards of any type - in fact I don't remember boxes of wine gums at all. Tubes, yes and loose wine gums, but not boxes. Maybe the script writer was thinking of Rowntree's fruit gums, boxes of which were available when I was a kid, although not including cards as far as I know. 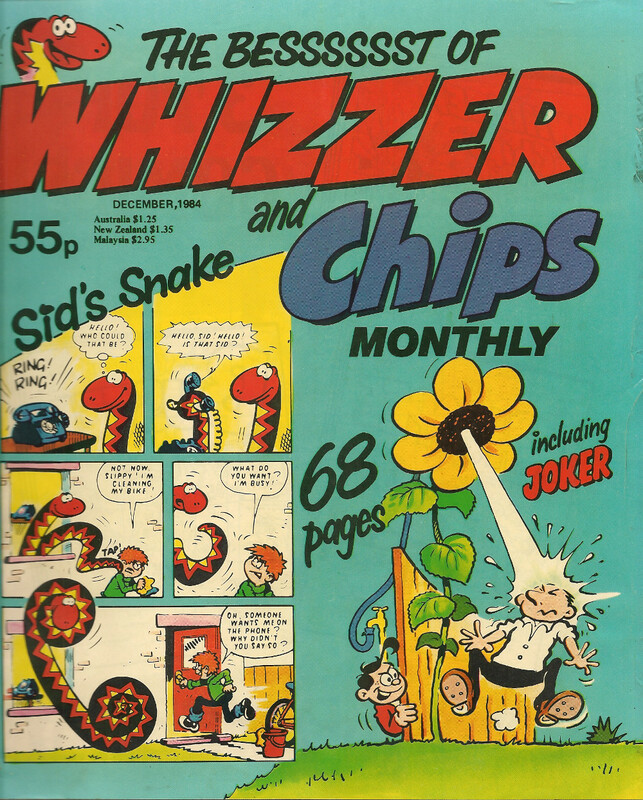 However by the time this issue of Whizzer and Chips was published my days as a young whippersnapper lay far in the past so maybe there had been developments in the wine gum market of which I was (and remain) unaware. 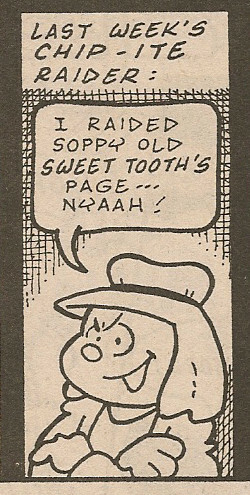 This is the first time in Whizzer and Chips' post-Whoopee merge era that Sweet-Tooth has been raided by an ex-Cheeky Weekly character, but Mustapha was clearly exacting revenge for the confectionary-craving kid's previous intrusions into his strips in the issues dated 28 June and 23 August 1986. 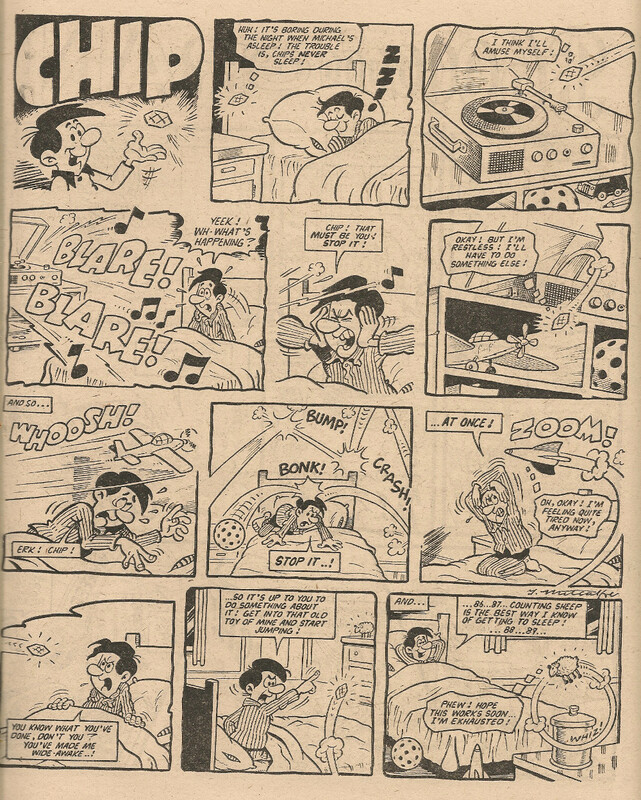 The above pages appeared in The Besssssst of Whizzer and Chips Monthly, December 1984. 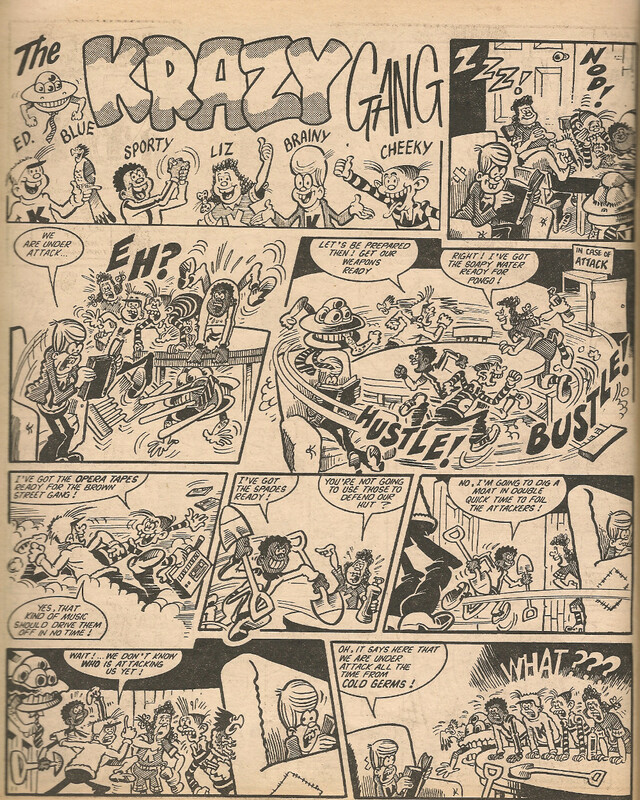 There are four 2-page Krazy Gang reprints in the Chips section of that issue, but in each case the first page has been paired with a wrong second page (I've matched the correct pages above). Fortunately all the correct concluding pages are present, albeit mismatched, so all four adventures can be enjoyed by flipping through the pages. 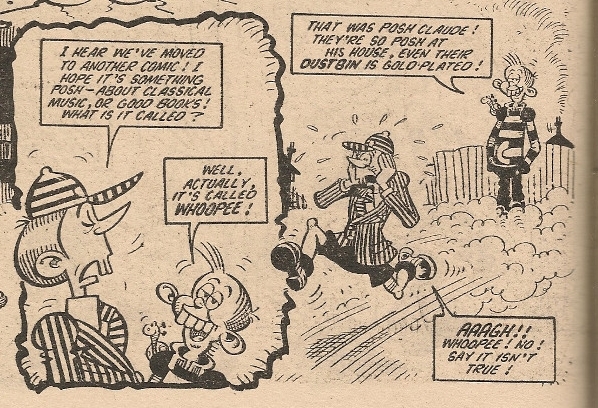 UPDATE 18 April 2019 - Many thanks to Stephen Archer who has identified Whizzer and Chips dated 08 December 1979 as the issue in which the above strip originally appeared. 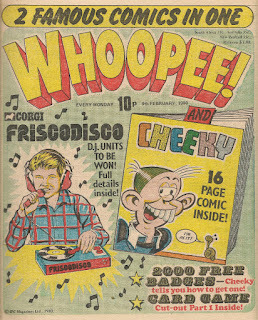 As mentioned in my earlier post, Cheeky Weekly's merge into Whoopee! was an unusual one, as the toothy funster and his pals were allocated a whole 16-page dedicated section in the centre of the host comic. Yes, half of the combined comic was given over to Cheeky and his pals! Now, I'm not enough of an expert on comics to say whether or not this was an exceptional amount of space to be allocated to a 'mergee', but I suspect it was. That's right, the Whoopee! characters occupied just a half-page more than their new Cheeky Weekly chums (and I'm being generous in classifying joke page Smiler's Smile-In as a Whoopee! strip). This was not so much a merge, more an attempted coup by the toothy funster and his fellow refugees. 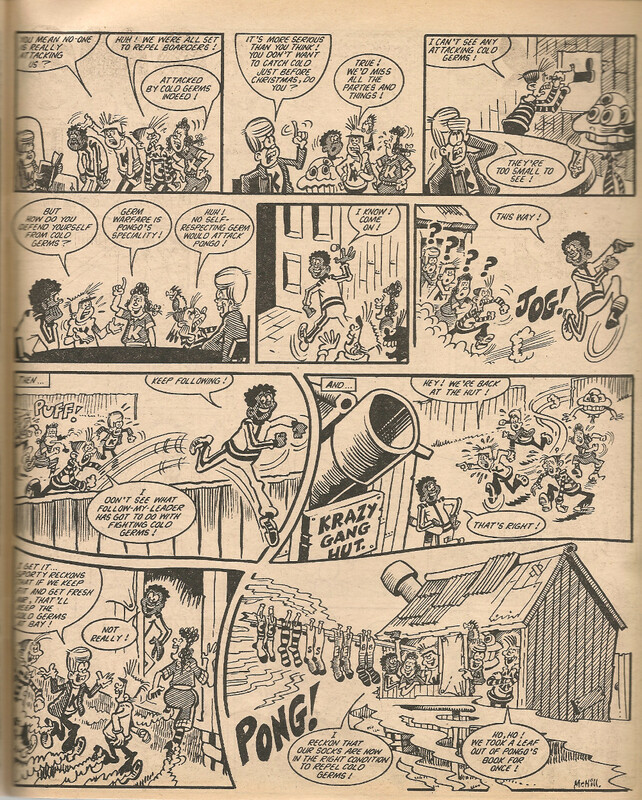 Since the Friscodisco competition was a one-off feature celebrating the inaugural amalgamated issue, a page was to become free within the Cheeky section in subsequent issues of Whoopee! and Cheeky. So which of the Cheeky Weekly alumni not already ensconced within its pages would be chosen to occupy the prized location? There were a number of quality contenders - Elephant on the Run? Disaster Des? Speed Squad? Sadly, none of those was to secure the vacant spot. Political manoeuvring by IPC management, clearly intended to prevent the Cheeky camp outnumbering their hosts, saw the installation of an inferior interloper with no connection to the toothy funster's iconic title. cover of the second combined issue. 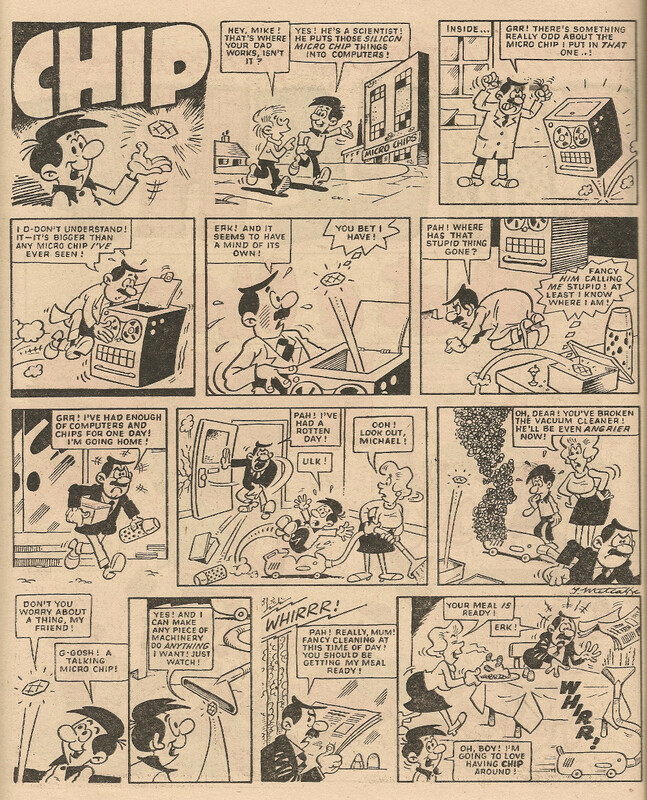 Chip, which made its debut on page 2 of the Cheeky section in Whoopee! and Cheeky dated 16 February 1980, was a new strip and therefore had no allegiances to either Whoopee! or the Cheeky crew. 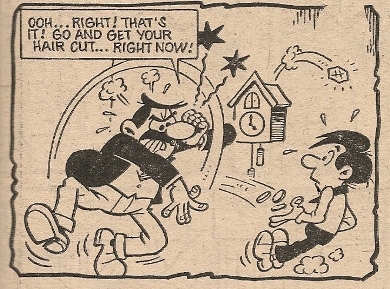 The rather ill-tempered and violent dad is distinctly unappealing but the main problem with the 'kid with gadget' set-up of this strip is its similarity to that of Calculator Kid, residing just 14 pages away on the back cover of Cheeky's comic-within-comic. I'm obviously biased here, but while I can accept the idea of a talking calculator, a giant, flying microchip with the power of speech (although in later episodes the titular microprocessor 'thinks' his dialogue) and which can control any machine stretches credulity too far. Mike's dad isn't just irascible in the first episode for the purposes of the set-up, he's unpleasant in subsequent instalments as well, and in early stories a feud develops between Chip and the peevish parent. Whereas Calc is almost infallible, Chip's interventions usually go awry. Mike/Michael is clearly too scared of his dad to ask him to take the irresponsible processor back to the laboratory where he works to get the thing reprogrammed. The Cheeky section within Whoopee! 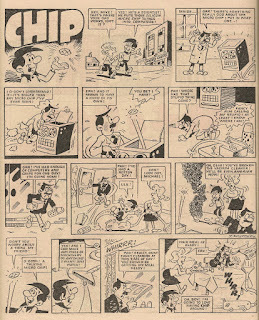 and Cheeky lasted until the issue dated 04 October 1980, and thereafter the strips that had hitherto been confined to the 16 innermost pages were freed to wander the comic. Since Chip's tenuous link to the Cheeky oeuvre ceased at this point, his activities from that date onward need not concern us. My intention for this post is little more than to acknowledge the strip's existence due to its (unwelcome) presence in the toothy funster's section. However, in fairness I have to report that the majority of Whoopee! readers clearly didn't share my opinion of the feature as Chip continued until Whoopee! 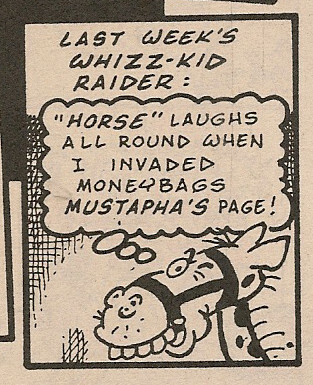 merged into Whizzer and Chips in 1985. 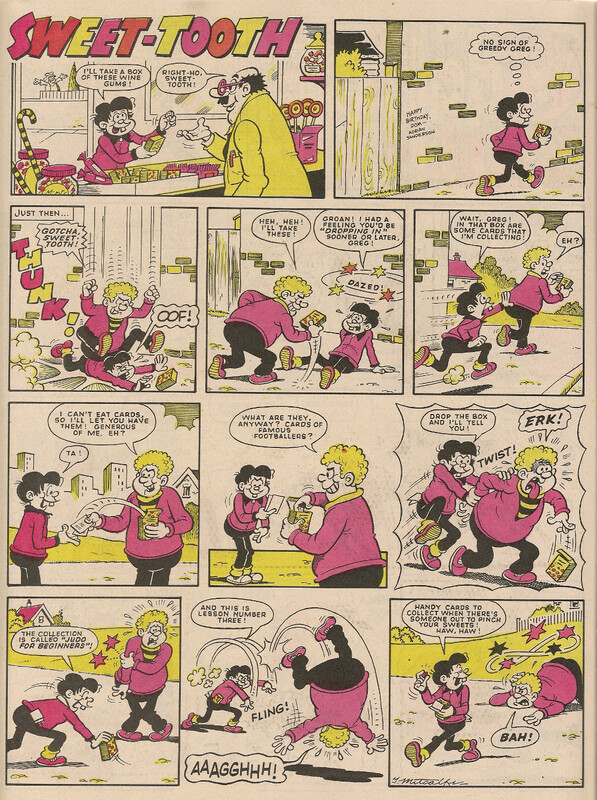 The final issue of Cheeky Weekly included two Disaster Des stories. Possibly it was originally intended that Des would transfer into the merged title, and one of those Des pages in that ultimate edition was originally prepared for use in Whoopee! and Cheeky. However, neither of the adventures in question have an explanation of the premise of the strip, which one might expect to see in the first episode of a post-merge feature. *Merry-go-Round was a concept which I'm assuming was introduced at the point when Cheeky Weekly merged into Whoopee! Each week a strip selected from a number features that had appeared in Whoopee! prior to the merge, yet had not secured a permanent slot in the combined title (such as Blabbermouth, Ivor Swap and Dads as Lads), would appear on the M-g-R page. This device allowed long-time Whoopee! readers to continue to enjoy some of their fun pals who would otherwise have been dropped to make space for the incomers, and this arrangement could be seen as an acknowledgement by the editor of the large number of pages devoted to Cheeky and his chums. Lew Stringer has given us a sneaky peek at some of the contents of the imminent (well, 17th April) Cor!! Buster Humour Special, including our toothy pal. 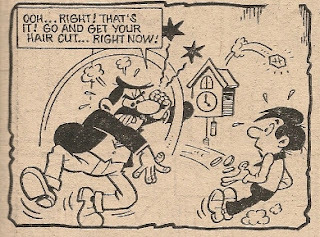 In the same panel that shows Cheeky, Lew has included the cover of Cheeky Weekly dated 25 November 1978. We learn from the cover of the first Whoopee! 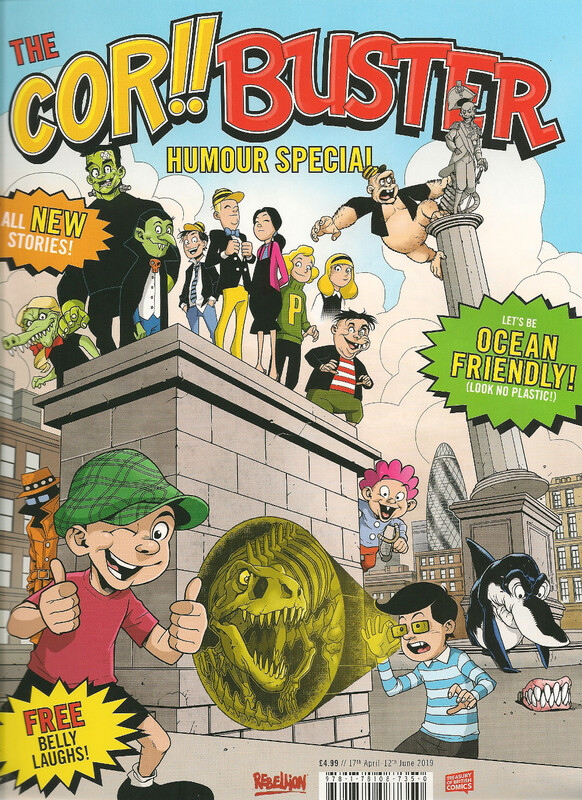 and Cheeky that our toothy pal and his ex-Cheeky Weekly co-survivors will be ensconced in a 16 page comic-within-comic in the centre of the host title, a rather unusual way of absorbing one comic into another (the customary fate of an underperforming title was its 'merge' into a more successful comic). Most 'merges' resulted in the features from the failed comic being interspersed among the pages of the host title. 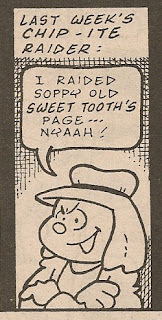 Cheeky Weekly wasn't so much merged into Whoopee!, rather the toothy funster's title was embraced by the elder comic. 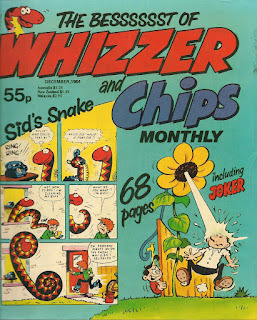 Whizzer and Chips had most famously employed the two-comics-in-one format since 1969, but the idea had also been used in Shiver and Shake, and of course Cheeky Weekly itself adopted the concept during the period in which the Mystery Comic occupied its centre pages (although adding an additional metatextual spin not present in the above examples by having the Mystery Comic being a title read by the Cheeky Weekly characters). Since the focus of this blog is on Cheeky and his pals, I'll home straight in on that very first Cheeky section. On the section's front page, our toothy pal is, unusually, sporting a blue and black jumper instead of his familiar red and black apparel (the new sweater was probably given to him by the Whoopee! editor as a bit of a sweetener). This is another use of an image that I refer to as the 'standard Cheeky face' which was first seen in the debut issue of Cheeky Weekly and on several subsequent occasions. The office cleaner has clearly been complaining about having to dust the boxes of Friend of Cheeky badges left in the corner of what was the Cheeky Weekly office. Snail makes his presence felt, as he did on the Whoopee! cover. The Curtain rises on Stage School with a brief résumé of the strip's premise for the benefit of Whoopee! readers, before the cravat-wearing showbiz teacher (who was rarely seen in Cheeky Weekly) sets a tough exam assignment. The title panel that appeared in the last few months of the strip's Cheeky Weekly run has been retained. Stage School's 2-pager is followed by a page carrying the details of the proper-front-page-announced competition to win a Friscodisco battery-powered record player. Erstwhile Cheeky Weekly readers may be a bit surprised to see a selection of Paddywack gags over the page, as the bumbling buffoon wasn't included among the band of characters shown to be transferring to their new home in last week's final issue of our grinning pal's comic. Readers are still being invited to submit their Paddywack gags (the editor clearly hoping to mine a previously-untapped source of gags in the shape of Whoopee! readers who, because the dithering dolt wasn't included in the Cheeky mini comic that appeared in their funny paper, were hitherto unaware that such a thing as a 'Paddywack type joke' even existed), although the cash reward for successful contributors has been reduced from Cheeky Weekly's £2 to a single quid BUT with a bonus Whoopee! Cushion prize which I'm sure is worth a pound of anyone's money. Next up is 6 Million Dollar Gran, or rather $6000,000 Gran as she has now been styled. Pauline Potts informs Whoopee! readers that the titular OAP is a 'bionic robot granny'. Well, at least this oxymoronic statement does acknowledge Gran's robotic origin. The next 2 pages of Cheeky's section are devoted to the first instalment of the cut-out Fib card game, IPC, as ever, never missing an opportunity to encourage readers to attack their comics with scissors. The cards feature characters from the newly-combined comic, so Cheeky, Mustapha Million, Snail, Gran and Calculator Kid rub shoulders with the likes of Whoopee! stalwarts Frankie Stein and Lolly Pop. Readers excising the game from within the Cheeky section would be losing the second of Gran's pages and the first of Cheeky's. Cheeky, seemingly unaware that he risks being glued to a cornflake packet then sliced into pieces, does the introductions in his whopping 4-page segment, titled It's Cheeky!. Well, obviously 4 pages is a bit of a comedown compared to the coverage he had in Cheeky Weekly, but it's a good number of pages to be allocated post-merge (the opinions of long-time Whoopee! readers who find their favourite strips jettisoned to make way for what they may well consider to be 'all this Cheeky rubbish' would no doubt differ). The monochrome printing means we can't tell whether the toothy funster is wearing his new blue/black jumper. Mike Lacey does his usual superb job, but it's a pity Frank McDiarmid wasn't on hand to furnish the inaugural artwork for Cheeky's Whoopee! era. I suspect Frank either took a well-deserved break for a week, or was busy building up a stock of Cheeky strips for future use. Like Gran, Mustapha has undergone a title revision which now reads Mu$tapha Mi££i(coin image)n - he was previously titled Mustapha Mi££ion although I rarely referred to him as such. 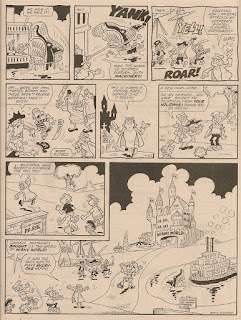 Joe McCaffrey clearly used Reg Parlett's artwork on the first Mustapha episode as a reference for the 3-panel back-story. 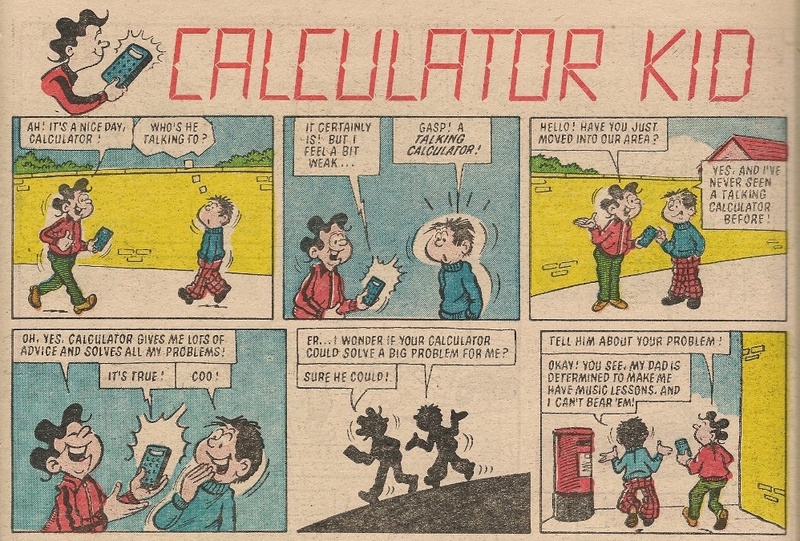 Rounding off the Cheeky section is Calculator Kid. It's remarkably fortunate for Whoopee! 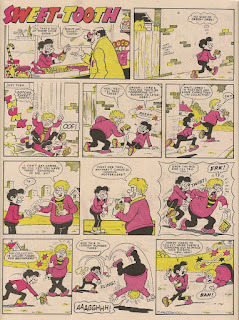 readers that just as the story starts, Charlie and Calc encounter a newcomer to the area (modelling rather alarming, baggy tartan trews), giving young Master Counter and his battery-powered buddy the opportunity to explain the strip's set-up. Whereas in Cheeky Weekly the feature had a title panel located at the left hand side of the first row of pictures, Charlie and Calc now have a banner-style title, although using the same image as before. 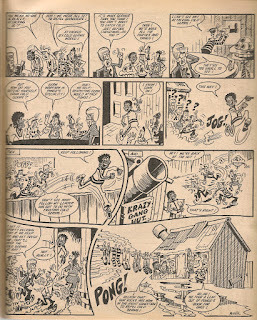 Long-time readers of the host title may have already been aware of Cheeky, Gran and Mustapha if they had read the aforementioned Cheeky mini comic that appeared in their 08 July 1978 edition. Other than the '2 Famous Comics in One' banner on Whoopee! 's front page and the Cheeky/Posh Claude gag, there is no mention of the 'merge' in this week's issue - not even a 'welcome to our new readers'-type message on the letters page (although some of the strips in the Whoopee! section do include introductory explanations for new readers).